The Internet is wonderful and can answer all your questions. For most of us, it is the main source for news. Indeed, we have immediate access to plenty of media from different parts of the world. But can they all be trusted? 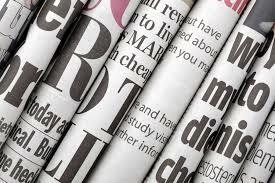 Using different sources and media, the press review helps you to find your way through the news and be well-informed. This is an informal sharing and discussion of the news in English. Please feel free to bring in an article that you would like to share with the other members of the group. This activity, free for library members, is organized by freelance journalist and library volunteer: Isma Hassaine-Poirier.